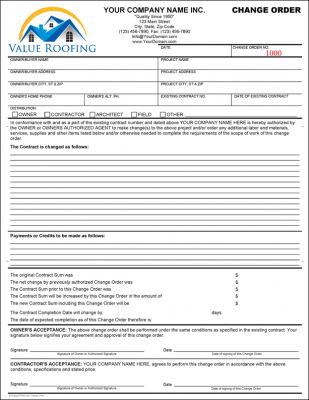 Roofing contractor forms, Roof Inspection Report, Roofing Estimate Form & Bid Proposal Form, Pre Construction Checklist, Roof Contract Form, Job Completion & Roof Certification Form, Free Sample - Roofing Forms, Warranty Certificates. 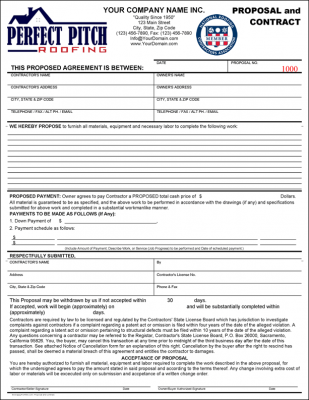 This 2 page proposal, has been drafted in such a way that, if it is accepted by the party whom the proposal is made (the "offeree"), which is typically signified by signing the proposal, then it may become a binding contractual agreement, and contractor may move forward with job/project. 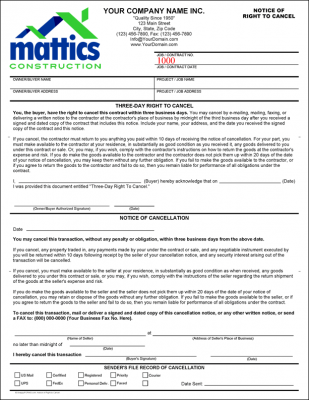 This Contract Change order is to provide written orders to make changes to the scope of work outlined in an original project contract. Change orders describe the new work that needs to be done (or omitted), the impact on budget, and the revised schedule for completion. 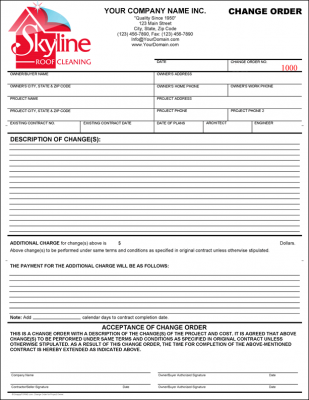 Change orders are common in construction projects, especially larger ones - in fact, there may be many change orders issued in a single project. Notice of Right to Cancel form is a federal and state law (FTC's Cooling-Off Rule) that gives a customer a 3 day right to cancel a sale made in his home, workplace or dormitory, or at seller's temporary location, like a hotel or motel room, convention center, fairground or restaurant. It also applies when you invite a salesperson to make a presentation in your home. 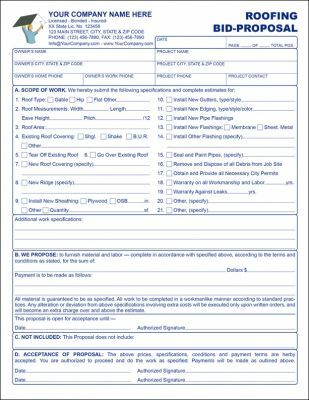 This is a must-have form for any home remodeling job. 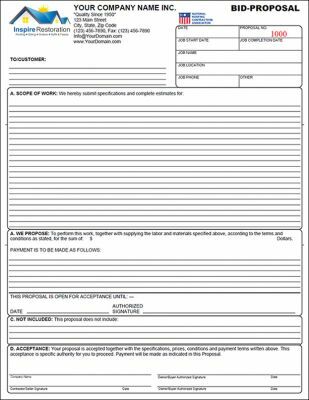 The form is easily and fully editable using Microsoft Word and the form also comes with an Interactive PDF form which is also fillable and can be personalized by editing your company name, address, form title, add your business logo and/or other trade or promotional images. 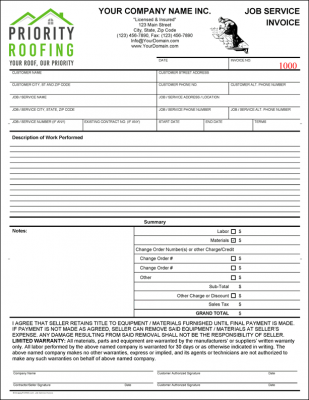 Job service invoice forms are for use by roofing installers, service or repair contractors to record job details with ease and efficiency. 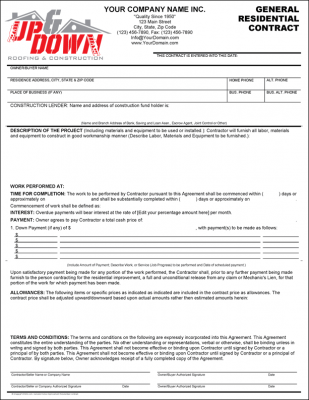 This job service invoice may be use as a stand alone invoice or in conjunction with a job under a contract. 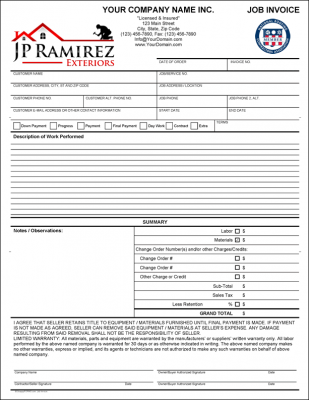 The job service invoice form has ample ruling for describing work performed, labor and material charges and other miscellaneous charges to be included such as change orders, misc. charges, and sales tax. 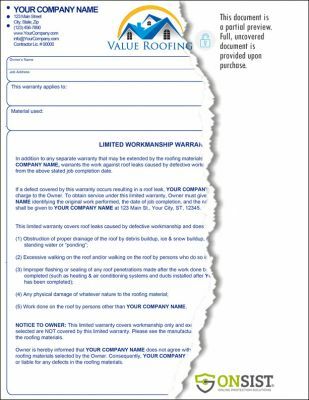 Help boost customer confidence that the work or installation has been done properly by providing your client with a roofing industry, all purpose, labor workmanship or parts warranty certificate after job completion. This has been proven to help gain traction with customer trust and word of mouth recommendations in the long run. 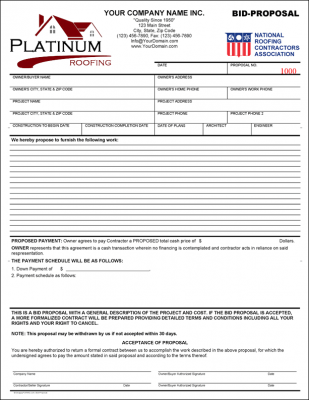 You may also opt to have one or many different types of certificates to comply with particular jobs or projects. 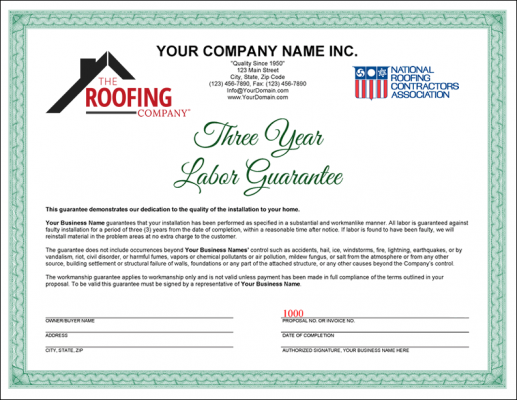 It may be a satisfaction guarantee, a warranty certificate on equipment or parts, a workmanship guarantee, an "x-Year(s)" parts warranty or quality pledge, an "x-Year(s) on parts or service such as shingle or tiles and roofing repairs and renovations, a lemon guarantee, the possibilities are many —and also makes a good starting point towards selling a maintenance agreement.